Dubai: While the Ajrak pattern might look foreign to some, if one is familiar with Sindhi culture, it is easily recognisable. A New York-based brand is selling a top incorporating the design and it is sparking some controversy online. 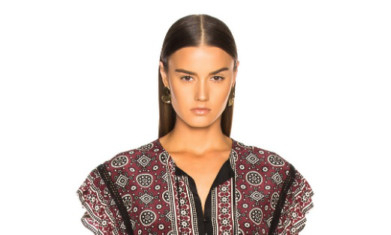 The clothing item uses the Ajrak pattern – a traditional Sindhi-style blockprinted cloth. Retail websites selling the piece, described it’s colour as ‘Brick Multi’ and some Pakistanis are asking for credit while others are claiming cultural appropriation. Currently, the item is priced at around Dh480 on a website called Forward. However, there are those who said that no copyright infringement arises with using the pattern and the retailer is not required to credit a particular entity. The pattern originated in Pakistan’s Sindh province. It is said to be traceable from the earliest archaeological findings of the ancient Indus civilization of Mohenjo Daro. The designing technique involves woodblock printing onto cotton cloth, resulting in unique geometric patterns. The designs are common around Pakistan and have become a cultural symbol of the Sindhi community. In the past, another American company, Urban Outfitters used the pattern on some of their swimwear and marketed it as ‘Moroccan Print’. Similarly, American fashion brand Forever 21 has also sold items with the design and called it ‘Baroque Print’.